Quilt shown made by Elsie Robinson from a Jinny Beyer Monticello pattern. The Chino Valley Quilters are excited to share an upcoming very special Opportunity Quilt. The quilt was made by Elsie Robinson; our member who was featured at our 2010 Quilt Show; Chino's Gone Quilting. The 2014-2015 Opportunity Quilt, "Elsie's Garden," will be displayed at various venues throughout the remainder of this year and until October, 2015. 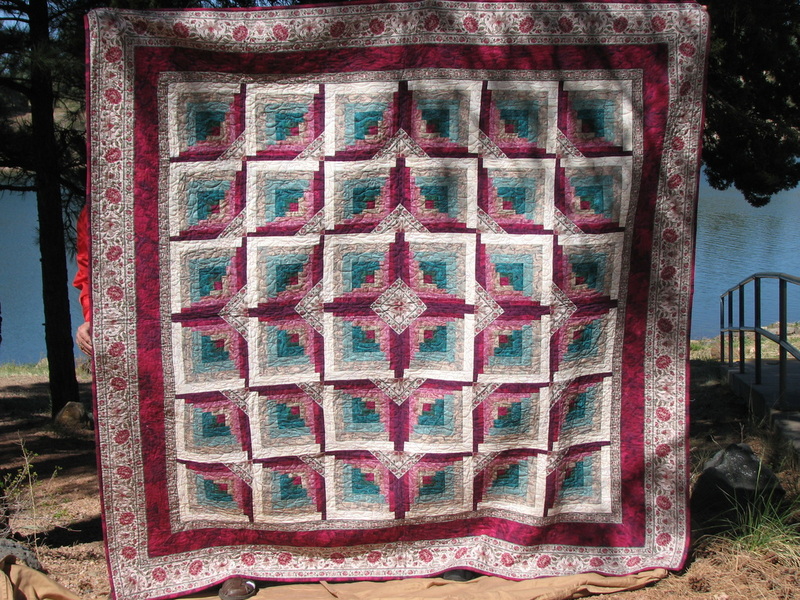 A drawing for the lucky winner of the quilt will be held at our October 2015 Chino Valley Quilters guild meeting. The new Opportunity Quilt is 79" X 79" and made of all high quality cotton fabric. Elsie selected the Log Cabin pattern that beautifully showcases the colors and fabrics used. The colors are exquisite and "bloom" within each block. A "heart" leaf overall quilting can be seen on the reverse side of the quilt or see the details in the right-hand column of this page and "Pause" the slideshow for a closer look. The quilt will also be displayed at our October 3 & 4, 2014 Fall Harvest of Quilts show. The new Opportunity Quilt is 79" X 79" and made of all high quality cotton fabric. Elsie selected a Log Cabin pattern to showcase the colors and fabrics she chose. The colors are exquisite and "bloom" within each block. At our October, 2015 meeting the quilt winner's name was drawn; Judy Sylvan of Prescott Valley, AZ. Congratulations to Judy!